Those of you who have stopped to read the history of the Project - that big notice on the playing field - will know that the work remained unfinished; but not for much longer. 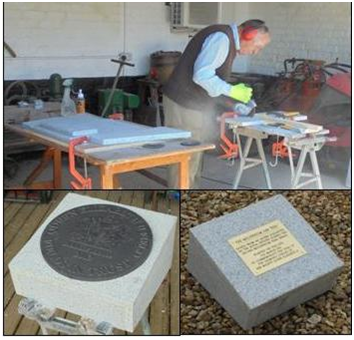 This year has seen the manufacture and placement of a large plinth bearing the QEII Fields-in-Trust plaque (under that big notice) together with a smaller plinth sited across the field by the Millennium Tree. This bears a plaque telling the story of the tree. Why, you may well ask, has this taken so long? Simple! The first choice material for the plinths, York stone, whilst a joy to work, proved too heavy to handle and prompted resort to a plan B. This involved fabrication of a lighter, hollow structure using silver granite slabs suitably reinforced with steel brackets and rods, all held together with the secret ingredient - 'Gorilla' glue (it really does do what it says on the tin!). Fixing on-site, achieved with the help of friends, involved more reinforcing rod, mortar and concrete but eventually the job was done. Of course, this all took longer than intended, but the result looks good and, hopefully, should stay the course. Only time will tell. I'm now the proud possessor of a York stone rockery and some rather expensive (but worn) diamond tipped cutting discs and drills - all procured at nil cost to the Council I hasten to add! The final phase of the Project is to landscape the field with plantings of trees and hedgerow donated by the Woodland Trust. Plans are already in hand to achieve this by the end of this year. Nine nominations have been received for the seven places on the Parish Council, so an election will be held on Thursday 7th May 2015, the day of the General Election and the District Council elections. To view the full list of candidates, click on the link below.